The Square Persimmon and Other Stories is an introduction to one of Japan’s most popular and versatile writers of fiction. In these eleven stories, Takashi Atoda examines universal themes – first love, lost love, change, fate – thriugh unmistakably Japanese eyes. The dreamlike quality of some stories invites the reader to draw his own conclusions in the denouement. Yet, in each one, Atoda brings to bear his precise style and his own unique vision, by turns mysterious, romantic, darkly humourus, and even bizarre. 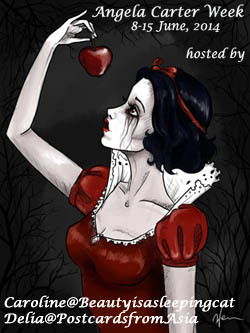 I found this truly magical short story collection thanks to Novroz’ review of the book. She made it sound so appealing, I absolutely had to read it. I couldn’t agree with her more, The Square Persimmon is a wonderful short story collection, enchanting, haunting and mysterious… Very, very special. I have never reviewed a short story collection and it is a bit hard. Summarize the individual stories? Summarize the whole book? Short stories are often so much richer than novels, to do them justice isn’t an easy task. To describe these is even more difficult as they are so mysterious. To try to capture their essence is almost like describing scent. I think the most intense reading experience is one that connects you to your own soul, that triggers something in you and lingers. Atoda’s stories even made me dream at night. I almost entered an altered state of consciousness while reading them. He managed to touch the part in me where memories lie buried and dreams have their origin. This doesn’t happen very often. They made me remember things I thought I had forgotten and sort of intensified everything. The best parts of his stories are like those rare dreams that we dream during our lifetime, in which we want to stay forever. The mood, the atmosphere and the feelings will stay with us for a long time. Apart from two of the stories, they are all very Japanese. They describe Japanese customs, food, places, philosophy, esthetics, sensitivity, and history. One recurring element is the use of flashbacks. The people in these stories encounter something that makes them remember someone or a place that is long gone, maybe dead. Another wonderful element is the description of the seasons. The cherry blossoms in spring, the leaves in autumn. They are meant to remind us of our perishability. The description of beauty’s utter fragility is another element. Each story has additionally a twist and a mostly surprising ending. The stories are all melancholic and often sad. The protagonists look back on something that has passed. At the present moment none of the characters is really happy, they look back on lost happiness. Nevertheless the interactions that take place in the present are touching and intense, the people in the stories reveal themselves to those they talk to. To give you an example I will just pick two of my favourite stories. In Paper Doll a man walks by a house in which he used to live as a child. It’s a beautifully elegant house. He had completely forgotten about this house, his childhood and a special friend – a girl – he had when he was a little boy. His life is not a particularly happy one. Like many of the characters in the stories he isn’t well off, struggles to make a living, doesn’t have a lot of joy. After he has discovered the house, he walks by daily and remembers more and more of those days long gone. His memories are like a treasure, they transform his dull days and fill him with an intense joy and happiness. The Honey Flower also evokes a memory. A man remembers a summer he spent in the country during the war in 1944. The horrors of war are masterfully blended with the memory of the little boy and his little beautiful girlfriend. The children met in secret to drink nectar out of giant white blossoms that grow on a tree. Atoda has written 40 short story collections. 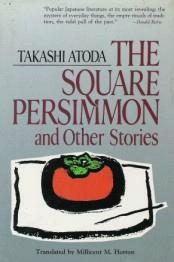 The Square Persimmon is meant as an introduction to his work. The stories have been chosen by his translator. The aim was to show what a versatile writer he is. His writing is extremely varied, at times lyrical or melancholic, absurd or full of black humor. In her foreword his translator, Millicent M. Horton, mentions the Proustian quality of some of his stories. This is high praise but I would say it is more than deserved. It’s a beautiful review Caroline. I couldn’t write an overall review oon short story, always ends up writing about each story. I will add your link into my review so that people can see it from different perspective. I really really want to read more Atoda-sensei’s short story. Thanks. I thought people will maybe check your review and then they will see the summaries but I guess I wouldn’t have done it anyway. I tried to capture the atmosphere, the feeling. Wow, he must have written an enormous number of short stories! I can’t think of the last time a book made such an impact on me that I dreamed about it–that is high praise indeed. I love short stories, but strangely I like reading the odd one here or there, as I can’t seem to make it through an entire collection by one writer–at least not in a short amount of time. I will have to see if I can find something by him in the library-perhaps in an anthology! I used to prefer short stories to novels. More literary sort of. Atoda is worth discovering. Although he seesm to have written quite a few absurd stories which I do not like so much. There is one in this collection. Well written but it didn’t move me. I have committed to reading some Japanese literature this year, having never ventured into this area before. These stories sound like something I should consider reading! Me too, I want to read a lot of Japanese authors this year. Already have a little pile. I loved these short stories and would be interested to hear what you think of them. I’m trying to read more short stories this year. But I often find them a little unsatisfying because I’m enjoying them so much, and then they end, far too soon. I’ll keep an eye out for this author. btw, Love Virtually by Daniel Glattauer just came out on one of our “upcoming releases” at work (I work in a public library), and I remembered your review, so have ordered a copy. Hope I get a chance to read it when it comes in. I didn’t have the feeling of them ending too soon. They are very rich and dreamlike… It works well. I know a collection that you might like if you haven’t read it already. I didn’t like Lauren Groff’s “The Monsters of Templeton” too much but her collection “Delicate Edible Birds” is really great. The Danish translator of Glattauer commented on my blog and said he had a look at the English translation and it did look very good. I am curious to hear what you will think of it. I got Margo Flanagan’s Tender Morsels…Couldn’t find the one you reviewed. Great review, it’s rare a book has such effects. I’m not a good reader of short stories: like Fence, I’m frustrated when they end too early. I’d like to read more of Japanese literature but I couldn’t find this one in French. I’m not sure he has been translated. Or his name is spelled differently, like for Russian writers. Thanks 🙂 I haven’t been this touched in a long time. I felt a bit self-conscious when writing it, but that was how I felt. I usually react more strongly when I read short stories. It is frustrating sometimes that the names are written another way. Even worse with German. Atoda did remind me of Hiromi Kawakami. She is a novelist. 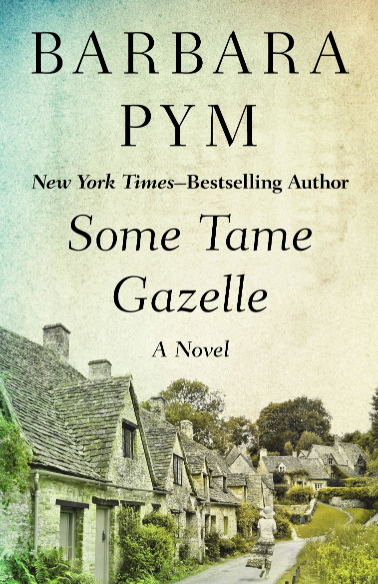 Some of her novels have been translated into German and the first one last year in English. She has been translated into French. I read La brocante Nakano. Novroz really liked Atoda as well but she didn’t like the same stories. I guess “The Square Persimmon” leaves the same impression on me as it did on you. Every story represents the idea of fleeting beauty, yet as it dissolves, it leaves traces of eternal values lingering in our mind. The book conveys the Japanese philosophy of wabi-sabi perfectly, in utmost simplicity. Thanks for this comment. I am not sufficiently familiar with the concept of wabi-sabi but I will try to find out more. I guess it refers to fleeting beauty, perishability. I still remember the feelings I had while reading these stories vividly. To a certain extent I would say, they transformed me, the put something in motion. There’s a lot of his books that have never been translated into English. I was looking in the bookshop today and found a kind of collection of black jokes written by him. I just translated one on my blog. It’s surprisingly British. Oh, great, I have to come and have a look. He was a very prolific writer it’s sad to think that only a lfew of his books were translated. I loved this collection. It’s absolutely stunning.